With the Euro Cup and Wimbledon behind us, and the Rio Summer Olympics underway, 2016 is shaping up to be a truly phenomenal year for mega sporting events. Yet, mass events are nearly always associated with mass food waste. In order to ensure that all athletes, fans and workers are fed, catering companies produce incredible amounts of food, of which some inevitably is wasted. There is also an issue with garbage separation during such events. During the London 2012 Olympics, cross-contamination of biodegradable and non-biodegradable food items proved to be a challenge for properly composting discarded food. The leader of the London 2012 sustainability program, David Stubbs, told The Guardian that cities must have the infrastructure to deal with the excess amount of waste in order for any recycling or composting program to be successful. In Rio, programs are being put in place to help curb waste, including Refettorio Gastromotiva, a cafeteria set up in Rio’s favelas that uses excess food from the Olympic village. Run by world-renowned chef Massimo Bottura, the cafeteria serves free meals to anyone who comes to their door. Bottura has invited chefs from around the world to participate in Refettorio, and has worked with organizations in the city of Rio throughout the process so that the cafeteria will still operate after the Olympics are done. You can learn more about Refettorio Gastromotiva here. From discount surplus food stores to hosting the Green Growth Forum in their capital city, Denmark has established itself as a world leader in the global fight against food waste. The country has more initiatives to reduce food waste than any other European nation, which have all contributed to a 25% reduction of food waste over the past few years. Their success is largely due to the grassroots initiative Stop Spild Af Mad or, Stop Wasting Food, a NGO founded by Danish graphic designer Selina Juul. The group aims to educate consumers on the impacts of food waste as well as bring media attention to the issue, through campaigning and being active in policy making. One particularly successful campaign tackled the issue of “UFOs” or “Unidentified Frozen Objects”. Stop Spild Af Mad has also partnered with Bo Welfare, a social housing organization in the Danish city of Horsens. They have worked together to establish a pop-up shop where customers pay 20 Kroners (about $3.90 CAD) for a reusable bag, then fill it with any amount of surplus produce from the store shelves. Another prominent organization in the food waste revolution is WeFood, Denmark’s first surplus grocery store that sells food originally destined for the trash, for 30-50% cheaper. The store has been a huge success partly due to its intentional resistance to being branded a charity. Anyone, from all walks of life can buy the discounted fruits and vegetables. This removes the stigma associated with going to a food bank and allows people from all socioeconomic backgrounds to benefit from inexpensive, healthy produce- all while reducing food waste. A startup company that has seen amazing success in fighting food waste is Too Good To Go, an app that connects users with leftover foods from all-you-can-eat buffets, which are popular among Danes. The app has now spread to 9 countries, prevented about 200 tonnes of carbon emissions by redirecting food waste and has provided thousands of meals to those in need. Denmark is making big moves in the fight against food waste. It appears that all of the food waste organizations are taking a bottom-up approach to the issue and are working towards shifting society’s relationship with food from away from indifference and towards one that is more positive and conscientious. As a majority of food waste occurs in the household, these grassroots movements are exactly what is needed to end food waste and create a sustainable food system! Thousands of pounds of produce cross the Mexican-U.S. border everyday, destined for grocery stores all over the United States and Canada. Once they arrive, truckloads of fruits and vegetables are assessed based on factors like market demand and physical appearance. If they do not fit the bill, they are dumped near the boarder or sent to the landfill. Yolanda Soto took notice of the waste and its potential to feed needy members of her border community of Nogales, Arizona. She began intercepting and redistributing food destined to be wasted at the border. Soon after, she started a food waste diversion program called “Borderlands Food Bank”. The program now serves over 16 000 people, providing fresh fruit and vegetables, as well as healthy recipes to food collectors. Now the CEO of Borderlands, Soto oversaw the redirection of 39 million pounds of food in 2015 alone. The company’s lengthy list of recipients includes over 150 non-profit hunger organizations across the United States as well as the Mexican State of Sonora. Soto’s hard work has not gone unnoticed, with stories of her success emerging in National Geographic. Read more about Borderlands Foodbank and Yolanda’s story here. World-renowned chef Massimo Bottura is joining forces with three Canadian chefs to combat food waste and end hunger. Bottura is the owner and chef at Osteria Francescana, a three Michelin star restaurant known for pushing boundaries and fostering innovation in Italian cuisine. Now, he is fostering a solution to hunger and food insecurity in Italy and around the world, by opening soup kitchens that serve gourmet meals made from rescued food. Bottura’s campaign against food waste began when he converted an old theater in Milan into a soup kitchen during the Expo Milan in 2015. Using only food leftover from the Expo, Bottura and a team of Canadian chefs created a gourmet meal and served anyone who came to the theater doors. 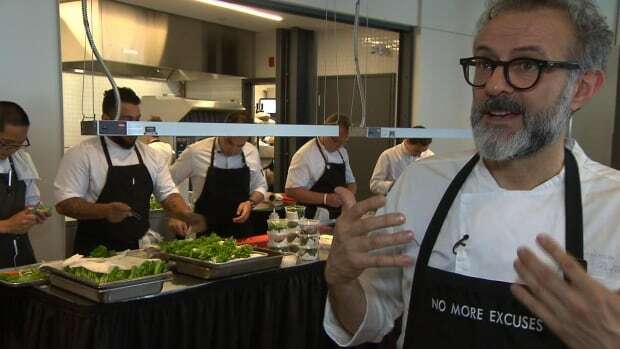 After completing a project called “Theater of Life”, a multi-media documentary based on his efforts to reduce food waste, Bottura is now planning to open another soup kitchen at the Rio Olympics using excess food from the events. Read Phi Center’s interview with Massimo here.